‘Cold feet’ describes my weekend, whilst David suffered from the ‘chaos’ bit! All will be revealed in due course. The weekend started very nicely on Friday night as David and I joined the Cheesemakers of Canterbury for their Xmas meal. Lovely pub, great food and good company. Jane had also provided 3 bottles of rather nice bubbly to help celebrate their ‘Super Gold’ in the World Cheese Awards. Their signature cheese, Ashmore Farmhouse, was voted one of the best 50 cheeses in the world. Congratulations to all! Out early on Saturday morning to Wye market and the start of the ‘cold feet’ weekend for me. Wye was quite busy with a lot of regulars but I think that our next visit there on 17 December will be the busiest one with everyone getting their Xmas cheese. There is an extra market on 24 December but I don’t know how busy that one will be – perhaps a few last minute shoppers! 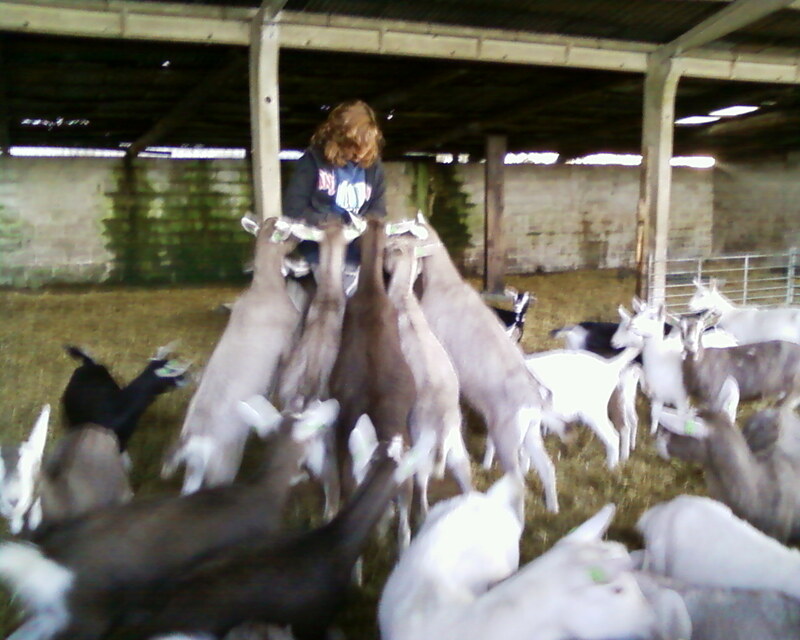 After a brief pitstop to get a sudden flat tyre sorted out on the way back from Wye, Jane’s daughter Kelly came back to the farm with me to spend the afternoon helping with the goats. She hadn’t seen the female kids in their new location and was thrilled that there was lots of room to play with them. Kelly loves to run round and have the kids follow her – a bit like the Pied Piper, she had all 54 of them trotting behind at one stage before she stood up on one of their boxes and got mobbed. Quick sleep and then off to Parson's Green on Sunday morning. More cold feet!! It was perishing cold. The market was good but seemed a little quieter than the last time I was there - other stallholders seemed to think it was quiet too. Maybe it was too cold for people, or maybe they were all out doing their Xmas shopping. Here's a piccie of my stall - also had our lovely handmade goat's milk soap on sale, which went down rather well. But, the main highlight for me was meeting Sara, mother of GeeGee parrot. I did not know what Sara looked like but was expecting a mad looking woman with a parrot under her arm. I was therefore slightly taken by surprise when an immaculately dressed and elegant lady came up to the stall, leaned over and bleated at me! Turns out that when GeeGee was invited to come out to market, she refused. Too cold apparently. Wouldn't come out for breakfast to start with either, by all accounts. Eventually, she was tempted by some walnut and goat's cheese (obviously a parrot with taste) but refused to let Sara put her in her travel cage. And so, I did not get to meet GeeGee after all. I am sure there will be another time. I did manage to have a lovely chat with Sara though and she was telling me stories about her childhood in Kent when she had her own goat Victoria. Apparently, Victoria used to keep Sara's pony company but when the pony died, Sara's mother decided that the goat would be lonely outside on her own and so she came to live in the house with the family. Apparently, she used to curl up to sleep in the kitchen in front of the Aga! On the way back from market, I got a phone call from a rather harrassed David who told me that he had just spent the last two hours catching goats and clearing up the mess in the barn. Utter chaos apparently! The girls had got bored after David had gone indoors for his lunch and had decided to break out into the barn. They cannot do much damage but had apparently made a lot of mess, climbing all over the hay and straw bales and helping themselves to the new large bale of lucerne that had been brought in for them that morning. However, not content with that, they then proceeded to push the gates to the little boys' pen and let all of them out as well - the little meat kids had a whale of a time running about the barn! Main problem for David, when he came back from lunch to discover the chaos, was that Bramling and Caffrey (our two little stud boys) were also roaming free and a couple of the milkers were in season that day. He is certain that more than one of them got mated and, it has to be said, Figgie goat did look rather smug and pleased with herself that evening! We could be in for a couple of little 'surprises' next spring. The occasion has been marked on the calendar as 'The Great Escape', so that any stray pregnancies can be traced back. Fortunately for David, the big males did not manage to get out, otherwise he would have had his hands full!! Given all the lucerne that the girls had eaten, they did not really want any more food that evening. There were a lot of very fat lazy goats lying around at milking time. And just how fat can a goat be? Well, here's a rather unflattering view of Footsie goat - not a small girl at the best of times but I think you can get some idea of how much she ate from the size of her belly! 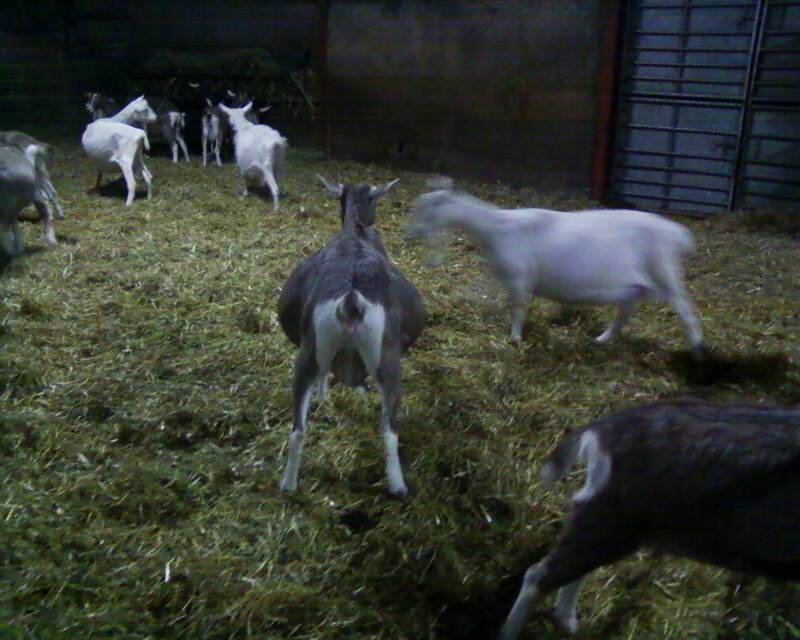 Good old goaties! Never the one to dish out sympathy, I couldn't stop laughing when he told me. I wanted to know if he got any pictures of it all but he said that he was too busy trying to get Caffrey and Bramling under control!! GeeGee the Parrot gets her own blog! Xmas comes early for Navajo! Taste of Kent Awards 2012 - Stop Press!! !